Accoding to Dicle Var from Evrensel News, Derya’s request for resettlement is neglected by UNHCR although she has fled from her family’s violence in Iran, and is claiming to not have life security in Turkey as well. 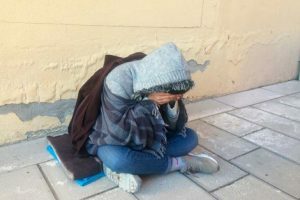 As her sit-in protest in front of UNHCR has been brought to media, lawyers from Refugee Rights Center of Ankara Bar Association and International Women Solidarity Association (UKDD) took action for her. However the lawyers were let neither in the UNHCR building, nor to negotiate with the authorities, they were instead referred to Human Resource Development Foundtion (IKGV, a local implementing partner of UNHCR). The officers from IKGV confirmed that they are following Derya’s case, and added that she has psychological problems and she has to stay in Turkey and do the things that are necessary to adapt to normal life. The lawyer Çelik (from UKDD) condemned the attitude of the IKGV and pointed that such institutions do not have a women’s rights based approach towards women refugees, therefore she will keep on supporting Derya’s struggle and bring it to agenda in different platforms. 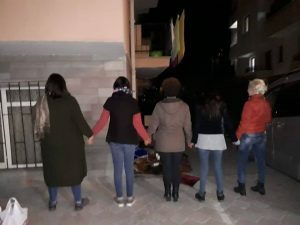 Followingly, a group of feminist activists from Woman Defence (Kadın Savunması) approached to Derya on 11th of November while she is continuing her protest in a car park across UNHCR Ankara branch, sitting on blankets and reading her book. “I came to Turkey twice. My brother wanted to kill me. I runaway to another city of Iran. I got lost and scared. I thought my brother will find me. They would find and kill me in Iran. I came to Turkey. I stayed 4-5 days. My mom got sorry, she cried. She told me ‘turn to Iran and live in another city secretly’. I returned for my mom, and stayed in another city in Iran for 22 days. My brother again found out that I was there. So I got a ticket and fled. Iranian police didn’t say anything at controls. It was like a miracle. This article is composed with the information gathered from the reports by Evrensel News and Woman Defence, and translated and edited by HarekAct.